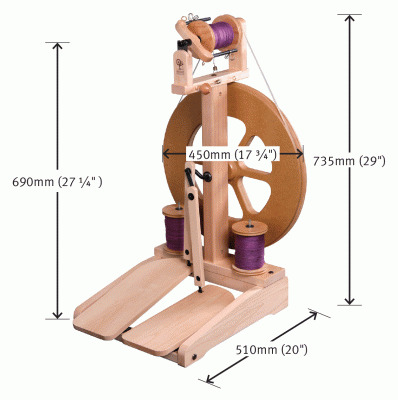 An excellent beginner to advanced wheel due to its easy learning ratios, double treadle and affordable price. Plus you get the fibre voucher. Ex display and demo wheel. It has been lightly used but has been to guild meetings so has a few superficial marks. It would be easily cleaned up if required. Complete with all bobbins etc. We give a full guarantee with the exception of the surface marks that may be present. 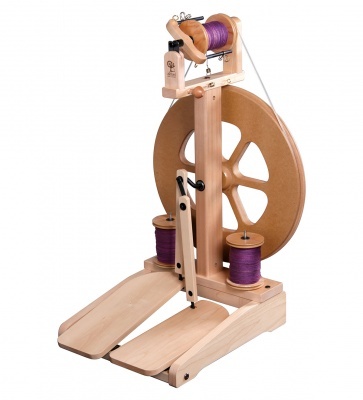 The double treadle of the Ashford Kiwi allows for easy treadling and “hands-free” start. Treadles are mounted on polyurethane hinges for a smooth, quiet and comfortable heel-toe action. The stretchy drive cord does not require any adjustment as you change from one ratio to another and always maintains the correct tension. The scotch tension allows easy control of the drafting process. The central flyer is convenient for right and left-handed spinners. The wheel is easy and quick to assemble with the Allen key supplied and the robust construction makes this an ideal wheel for individuals, schools and clubs. The wheel itself is made of MDF, a high-density durable wood product that can be painted or decorated.